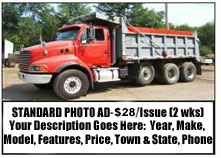 Post your commercial trucks, heavy equipment, & equipment trailers, & related big trucks & construction equipment for sale or rent in our magazine ads & online classified ads. Simply fill in ad form below. Proven results for your advertising dollars! Check out reviews & testimonials from local advertisers! 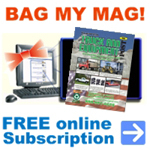 "online" magazine & Online Classifieds. In print magazine & online! #1 -Keep the sun on your back! #2 - Frame your photo properly. #3 - Watch Your Backgrounds! #4 - Watch Your Foregrounds! #5 - Use Your Smart Phone's Camera. #6 - Use Proper Lighting. #7 - Clean Trucks & Equipment. Take a hose to them, give them a bath, hope for heavy rains! Mud, salt, leaves, etc. on trucks & equipment may make them look older or damaged in the photos. #8 - Contrast Backgrounds. Look for a different color background than your truck or machine so it stands out better. For example, putting a white box truck in front of a white building may look like the truck blends into the building. #9 - Protect Your Camera. If you have to take photos in the rain, use an umbrella or clipboard to cover your camera. On very cold days, keep your camera in your pocket or under your coat. #10 - Use Photo Editing. There are many photo editing options to improve your photos. Many computers and smart phone cameras have built in photo editing options. Check your devices, ask Google about photo editing on your device or ask a child! There are many reasonably priced photo editing software options available, including some versions of PhotoShop. Anyone placing an ad receives a FREE online subscription! The new magazine will be emailed to you as soon as it's available! & put "BAG MY MAG" in the subject line. Would you prefer to mail in your ad instead of submitting online? For other sizes of magazine ads, rates, or to get a FREE ESTIMATE for an advertising campaign to fit your needs and budget, please call 888-887-0505.